2014 -Es war ein gutes Jahr für das Schreiben und Tomaten. 2014 was a difficult year. It was a year of very large statistical variances…very high highs and very low lows. In retrospect, I recognize it as a phenomenal year of change. Change is never easy, particularly when thrust upon you unexpected…unplanned. But you manage it, take the opportunity life gives you and move on. Eventually, things even out. It is important to remember that life happens to other people as well. And the recognition and ability to help each other out in times of crisis is what makes our human existence different from other creatures. I encourage each and every one of you to do something to help someone in 2015. At the beginning of 2014, I posted a resolution post with three goals for the year about writing. I think I achieved two of them. I did attend a local writing conference and had a blast. I will do that again, and will seek other opportunities to improve. I wrote a lot this year (even without participating in NaPoWriMo in April) and ventured beyond poetry for much of it. I did seem to devote several posts to tomatoes…but it was a banner year in my continuing efforts to grow good tomatoes. They tasted good too. I made numerous batches of salsa, tomato sauce, fried green tomatoes, and a season ending green tomato salsa, which was such a hit, that my plans to freeze most of it and save it for winter months was squashed. It was gone after 2 weeks. I traveled this year. In May, my father, my eldest son, and I traveled to Germany for a bus tour of the country. It was a GREAT trip. It is worthy of several posts on its own, but I just haven’t plowed back into my journal and pictures to write posts on that. A recent blogging exchange about Johann Sebastian Bach reminded me of the trip and I thought I would share this. On our trip, we had numerous stops and very short (or at least in my opinion…short) durations to see the sights. One of these stopovers was in Leipzig. We had two hours to see sights in the old town, shop, snack, etc. 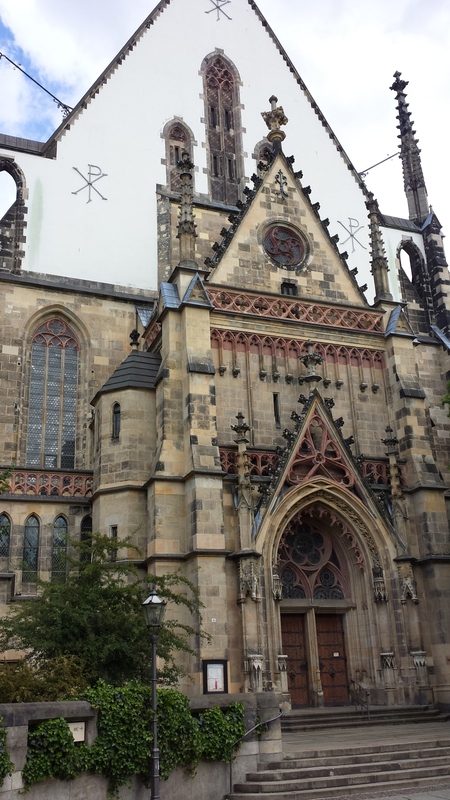 The bus stopped in front of St. Thomas Church, where JS Bach served as cantor. 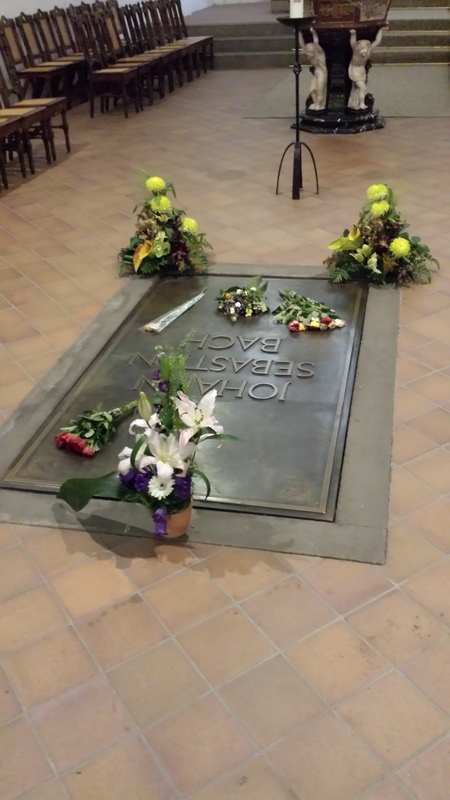 Bach’s tomb is prominently placed in the front chancel area behind an iron gate. During our short time there, we were fortunate to listen to a choir rehearse from the choir loft. And in no time, 2 hours was gone (I have tried to upload the short video I made of a portion of this, but WordPress does not like my video). 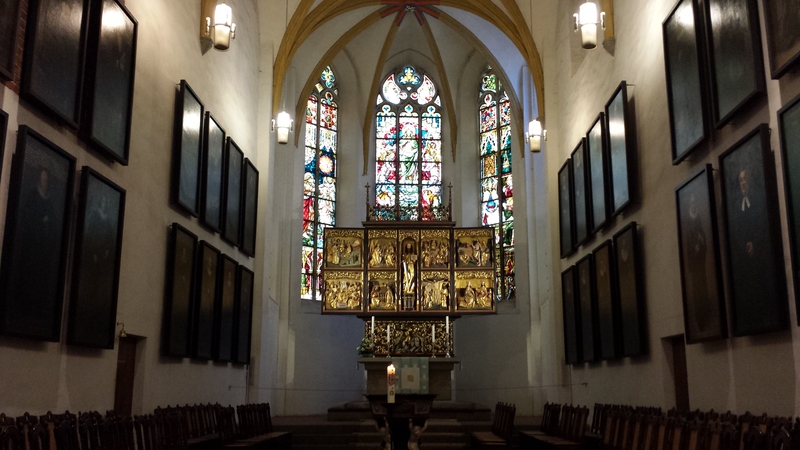 Here is a view of the altar, past where Bach’s tomb is located. Germany was definitely a highlight of 2014, lots of good food, fellowship, mountains, and castles, and I will strive to post more of our travels in 2015. Later in the year, after such a peak experience, there came an incredible low. I was released from my job. A bitter pill, but I am better off mentally and physically. I’m still looking for full-time work, and am hopeful that 2015 will bring not just a job, but the RIGHT job. So what does 2015 have in store. I don’t know…but I am setting up for a really great year. I will continue writing, and if 2014 has taught me anything, it is to be willing to go into the unknown. So my writing may be somewhat different this year. I may try my hand at short stories. I also want to go to another writer’s conference or perhaps a workshop. And to all of you out there, Happy New Year, and I wish you all the best in 2015. May you experience all the joy and success you can hold. 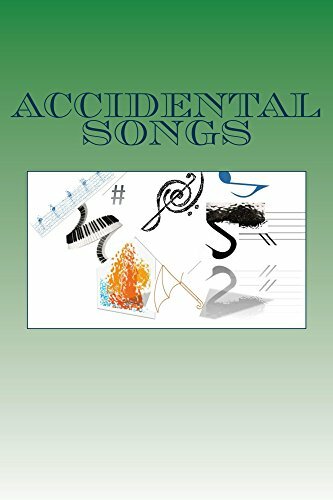 This entry was posted in Blogroll, Cooking, knowledge, Music, nostalgia, prose, Travel, writing and tagged Bach, Germany, Not Poetry, prose, Tomato, writing, year in review on December 31, 2014 by John S.